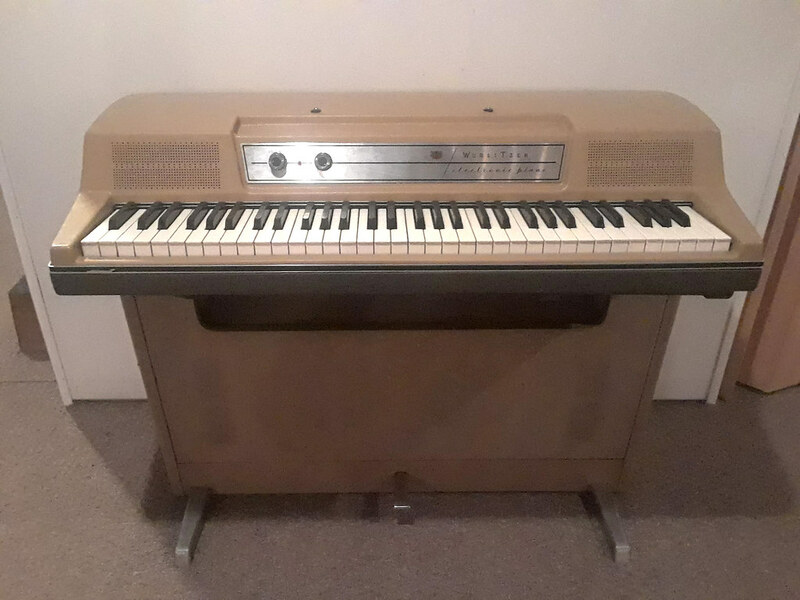 Just got a great deal on a Wurlitzer 206a with a cool story. I purchased it on Reverb with Local Pickup Only option. Nice gentleman. Told me it had previously been modified by Richard Goodsell of Goodsell Amps for a 1/4'' out. The whole time I'm talking to him I'm thinking he looks familiar. Turns out the guy used to be the guitarist/bassist in Sheryl Crow's band, Noel Gallagher's High Flying Birds and has toured with Sugarland. Pretty cool. On to the piano. It's in good shape. It has two 8" speakers in the console and none in the piano itself. I find the sound of the speakers in the console to be very bassy. I've been debating since I got it whether to chop it or not. I'd love to have it more portable to take out. Then I got to thinking about unscrewing it from the console and installing a speaker jack. I could still play it through the console when I'm at home, then if I play out I'd just take the piano itself and put it on a stand. Anyone done this? 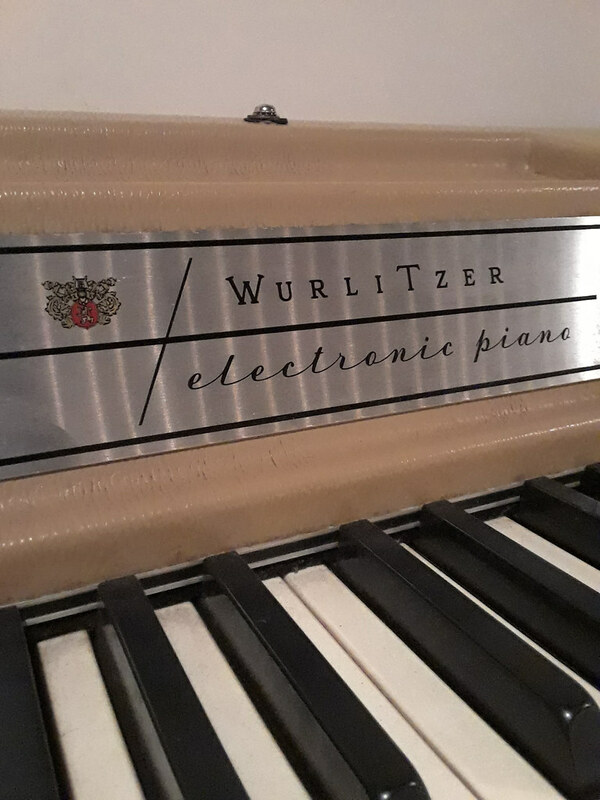 Re: Wurlitzer 206a - To chop or not to chop? That the one that sold for $725 in Georgia? Nice buy! I'd chop it safely so you can always revert. If you don't plan on moving it for a while then i'd leave it be. I agree with cinnanon, chop but keep the parts. I don't have the speaker cabinet for my 206, but I stashed the original "Student Electronic Piano" faceplate. Without the speaker attached, the 206 is easy to store. This begs the question: How many of us actually take our Wurlitzers out to gig? (This might be heresy, but) I'm happy to just take the Nord Electro. I don't think anybody in the audience cares. I'm happy to just take the Nord Electro. That's what I do. Mainly for ease of moving between Wurli, Rhodes and B3. There would be a few times a year where it would be nice taking out the real deal. Leave it in one piece. That is too nice a relic to do this to. There will be a day when those student pianos will be rare. Primarily because they get chopped, or, because of their weight and size, get dropped down the stairs or out the back of a van for a gig. And it might just be that you could regret the chop in the future. I have an old B3, a Rhodes and a Wurlitzer, and the one keyboard that I think can't take the "oops" is the Wurlitzer. The board is delicate. The reeds are an accident waiting to happen. The old solder joints will fail when you need them most (because one jolt back a few weeks ago weakened a solder). What would make me take them to a gig is pure pride, plus the multi-sensory experience of playing the real thing with fellow musicians and an audience that appreciates the nuances of the keyboards (rare). Again, just an opinion, and if you do go ahead, it would be great to see how it looks cosmetically. The solder joints, get yourself a good heat tracking adjustable solder iron and carefully reflow all the joints on the amp/preamp and you should be good to go for another few decades as far as that is concerned. But yeah why does everything need to chopped and not just taken for what it is? It will never be an original 200/A and after the vivisection, an original 206. And if it was acquired wearing a halo effect, more so should it remain intact. Unfortunately it already isn't an original 206A... the faceplate is a 200A faceplate. Heck it might even have vibrato already with history like that. Did everybody catch the vivisection comment? Now THAT is colourful and full of passion! I don't think that we have to be purists when it comes to preservation. Replacing the board on my 200A with a Retrolinear keeps me loving the rig. Before that, it was "what the heck is wrong NOW?" And the VariVibe, well, I kept the original faceplate, and I love the sound even more. And with the Rhodes, I stripped the felts back and glued in the little "miracle mod" rod bits and reglued. Not original, but the action is so much better. There is room for a huge array of opinions here, seeing the discussions healthy. Correct. It isn't a pristine example of a 206a right now. At the point of me purchasing it...Vibrato had been installed, faceplate changed, 1/4" out added, all the wiring coming out of the "junction" box in the console had been clipped, and only one of the two 8" speakers was wired up. Still on the fence on whether to do anything further but I appreciate everyone's opinions. Anyone with a 206a with a console find the piano very bassy amplified through the 8" speakers? I am on team Don't Chop It. The result is still a heavy beast. It is a lot of work, so also I am on Team Lazy. I also think the time, money, and effort spent on the chopping modification would be better spent on... finding and buying a 200A (or another keyboard, Swedish or otherwise). I think my 206 does sound bassy, but I have it in the basement, and the 40-year-old speakers are pointed at my knees. You can use the 1/4" output to go to the house, or to a mixer to split it into monitor and house and headphones or whatever. However, if after listening to all us naysayers, you still are inspired to chop it, then you know in your heart that you should. The result is still a heavy beast. I saw on Reverb a chopped 203W. Front cover came off and revealed chrome legs and a separate sustain pedal. It also revealed latches that allowed the top to detach. Pins for aligning it back up. Selectable between lid speakers, lid+ front cabinet, lid + back cabinet, or front+back cabinet speakers. Any possible combination you can think of. When detached the top played through just the lid speakers. The result is still a heavy beast, but you can't tell it's been chopped. This is one of the coolest things I've seen. That's the way to do it and keep it classy with a nod to the past. You know, I've changed my mind. That is a piece of art. it's a very thoughtful chop. As a mater of fact, chop is a term that is too lowly for this creative masterpiece. Wurlitzer should have thought of this in the first place for this model. Before I got the 200A, I had one of these. I didn't like the look. It's great to see these 'convertibles' -I am thinking of making one myself. I really like the sound of the console boxes, especially the 4 speaker models. Maybe there is a market for a 'retro-fit console' -for when it's at home, hahaha. The Student console with the hole, would be an extra challenge, but you could construct a new front baffle. It would be nice (but expensive) to re-tolex and grillcloth with something cool, I've considered that. I'm okay with doing cool custom stuff with beaters -it's your piano. Usually the Student models I find are in really bad shape, probably so many ended up in school dumpsters it's hard to imagine. I think if freeing the piano from the base gets it out of the corner collecting dust and playing, it can be worthwhile if done 'properly'. 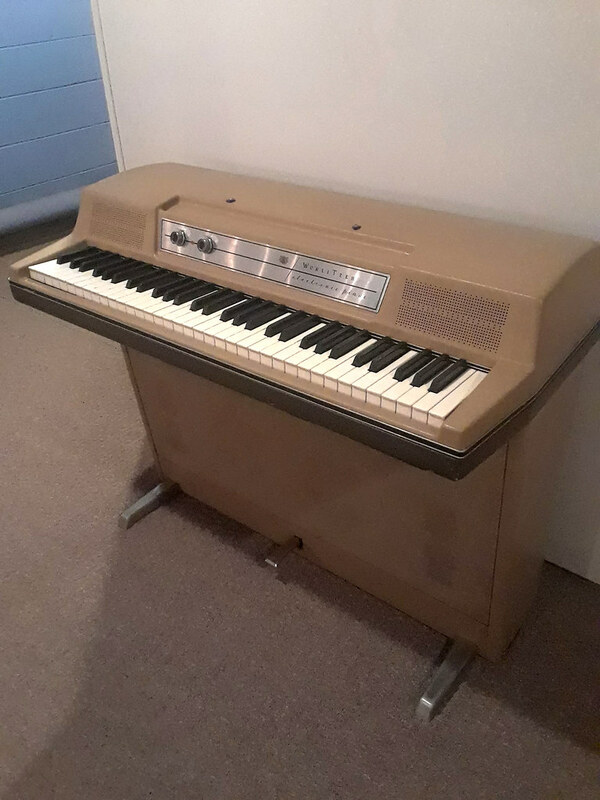 There are some nice Student consoles out there and restored ones, but usually they are ugly boxes and no one wants them like they want/need a giggable Wurly. They don't ship easily, so they're hard to sell. 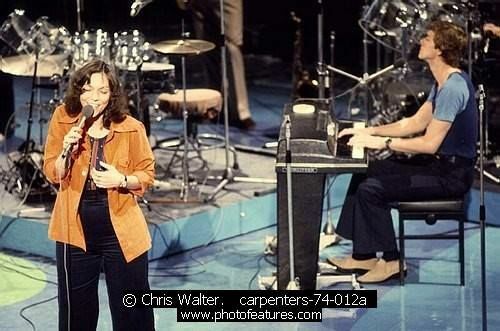 I take the Wurly whenever possible, and loan one regularly for studio and stage. They are actually pretty tough. I've got a 215v that I'm planning that above chop. I've done it with wooden dowels and plan next to do it with piano balance rail pins to keep it tight. Never seen the pedal and legs idea inside though, thats very clever. If you're planning the chop, make sure to put a 8ohm load on that speaker output when you disconnect the speakers. otherwise you'll learn the hard way like I did. I have a 206a that disconnects only for movement and you can't tell the difference when its together or apart that it comes into two pieces. This this have a working Keynote visualizer??? I've got a 206a as well. Always thought some day that it'd be cool to put a stereo amp with trem like the Suitcase Rhodes. Maybe even put larger speakers in there. I thought of that too but I would advise against putting a large speaker and amp in there. Some 206’s feed back already and you will get tons more if you beef up the cabinet. If you do you should isolate the keyboard as much as you can from the cabinet with springs, soft rubber or other doo-dads. No unfortunately not! But if you know where I can get one please let me know!